The Standard & Poor’s/Case Shiller index released yesterdat posted a fifth successive rise, increasing by 0.9% which was above the median estimate of 0.5% and so adding to the mounting evidence of a recovering US housing market. All 20 major metro areas posted gains in June from May. 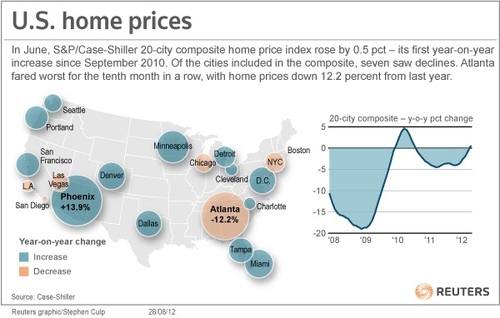 This is now the second straight month in which prices have risen in every city in the index. There was also a year-over-year increase, which was the first since September 2010, a year when housing benefited temporarily from a federal home-buying tax credit. It looks increasingly as if the US housing sector has turned a corner with a decline in foreclosures and the lowest mortgage rates in decades finally helping some of the cities hardest hit by the housing bust. Like the proverbial bird rising from the ashes, prices have surged nearly 14 percent in cities which were hit the hardest such as Phoenix in the 12 month period through to June, whilst Miami has risen 4.4 percent. The positive sentiment and momentum is now spreading throughout the US. Last week, the National Association of Realtors reported that sales of previously occupied homes jumped 10 percent in July compared with the same month last year. 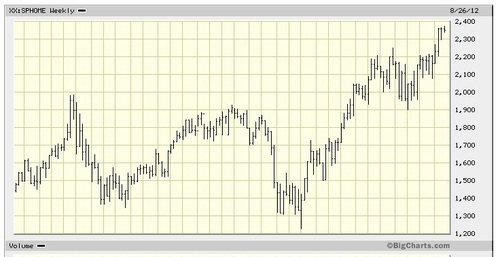 US listed ETF S&P Homebuilders has paced some strong gains this year – look at the chart below – housing stocks there are in a strong bull market. Builder confidence is also returning and rose this month to its highest level since the housing market went bust five years ago. Low interest rates have also provided a boost with the average rate on a 30-year fixed mortgage remaining below 4 percent all year. It is cheaper to own than rent and buyers are no longer scared of losing capital from falling prices. At some point, consumer spending will begin to respond positively as higher home prices generate new equity and stimulate the “wealth effect”. We also note that the wealth effect is also going to receive a boost from the stock market as US indices near all time highs. The US housing market certainly has a long way to go to recover from the peak set back in late 2006 and early 2007 bu,t the long bear market now appears to be over. Many of the experts (remember Nouriel Roubini’s depressing article from a few months ago?) are predicting another recession for the US, but a housing market that gathers momentum in 2013 and 2014 could prove to be the left of field catalyst that actually propels the US economy. Housing is a key driver of the economy and labour markets and if price increases persist, then we can expect the positive impact to flow throughout the economy. 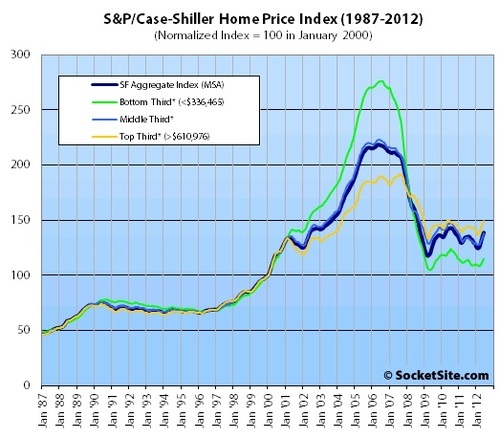 Nationally, prices in June were 31.6 percent below the peak hit in April 2006, based on the S&P/Case Shiller index. In Phoenix, they were consistent with levels from 2002. In Minneapolis, prices are near 2001 levels. We still think the Fed is sufficiently troubled by the economy, low growth and high unemployment to move on another round of quantitative easing before the end of the year. The housing market recovery may well be a major story for the US economy next year and in 2014. 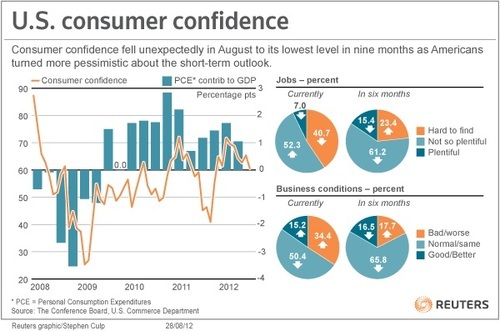 Yesterday’s consumer confidence data will provide the Fed with further impetus for the QE argument. The Conference Board, an industry group, reported yesterday that its index of consumer attitudes fell to 60.6 from a downwardly revised 65.4 the previous month. Economists had expected a slight increase to 66 from July’s original reading of 65.9. August’s figure was the lowest level since November. The expectations index tumbled to 70.5 from 78.4, while the present situation index edged down to 45.8 from 45.9. With additional fuel to the fire with a 3rd and final bout of QE still a possibility, housing is an area of the market place you probably cannot afford to be out of.